I’ve been in Portland just a few days but this city has made such an impression. Cars here stop for pedestrians and no one honks their horns. It’s a very special place and it’s made me wonder. Is there anything wrong with this city? I’m a bleeding liberal at heart so I don’t mind the hippies and I find the hipsters amusing. This city has grown on me so quickly and I can see why so many people fall for it. 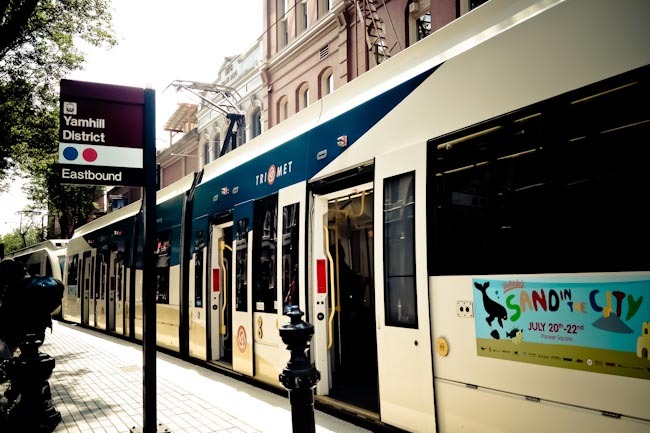 Portland is such a small city but the public transportation is amazing. One of the most annoying expenses traveling is coming from the airport but Portland makes it easy. The number of cyclists in the city is also pretty impressive, this is a city focused on alternative transportation. It may be weird to say but hearing or seeing Spanish is very comforting to me. I’m still very much only a beginner in my ability to speak it but somehow it’s familiar and I like hearing and seeing it. The language I learned to love and change my life in so hearing it is a reminder of who I really am. Here in Portland I’ve noticed Spanish all over the place, although oddly enough no Spanish-speaking people. Portland has such a commitment to sustainable food, so crazy that the Portlandia clip is not too far from the truth. With street carts and farmer’s markets dotting the city, despite not liking Voodoo Doughnuts, it’s an amazing place to eat. I grew up with a love of books and it was the hardest thing to sell before I left for Mexico over two years ago. I now read from a Kindle but have such heart for book stores. Powell’s is incredible, not only is it the biggest store I’ve visited but it also supports local writers who self-publish. You could spend a lot of time here. But I have realized there is one thing unsettling about this city, nearly everyone is white. It’s kind of creepy, especially coming from a city so diverse as Toronto. One of the reasons I was okay with no longer being nomadic is because you can experience so many different cultures in one city. I like Portland a lot, and it’s a city I’ll visit again but I won’t be tempted to move here like so many others. You have no idea…I can’t remember if we chatted about this when we met up while you were in Portland. It’s one of my favorite topics to chat with visitors about. They’re usually the ones who notice how white it is here in Portland. Everyone else is totally oblivious. If you Google “Oregon Race History”, there’s a great PDF you can download with some interesting tidbits, like the Exclusion Law and the Lash Law, which encouraged Oregon’s “whiteness”. Portland used to have a town to the north of us, called Vanport. It was the second largest city in Oregon during the 1940s. It was also where all the black people lived, along with immigrants from all over the world…until it was flooded in the Vanport Flood in the late 1940s. And it was never rebuilt. I could go on! Thanks for sharing this!!!! I understand what you mean about everyone looking European. Before gave up my apartment in Boston and hit the road, I went up to New Hampshire for a weekend and instantly noticed that it was homogeneously white. It’s because I’m so used to being in a heterogeneous environment. 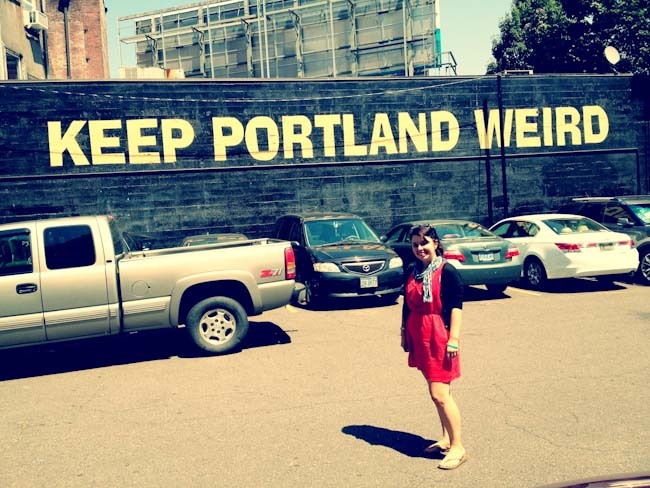 Have never made it to Portland, I presume it’s a good city to live in but not very touristy? Everyone is in love with Portland! I’ve been when I was little because my uncle lives nearby, but I need to go back as an adult and see what all the fuss is about. I love that clip from Portlandia! One day I’ll get down there. I think they went for burgers! My friend lived in Portland for years and she’s been trying to get me to visit there with her for ages. I’m loving this post – Gives me a little insight into what she’s talking about. Haha. I LOVE Portland. For all the reasons you mentioned and many more (beer being at the top of the list). I’m pleased Portland lives up to the hype. Steve and I are huge fans of Portlandia, and can’t wait to visit one day. It sounds amazing. Loved this post and the photos. I’m a Vancouver gal, and have shamefully never been down to Portland as an adult. My trips always seem to be far and wide, but I haven’t dedicated nearly enough time to traveling in my own neighbourhood, if you will. I love that you’re taking some time to explore North America! Wow, people LOVE Portland. Never been, myself, but every person I’ve spoken to absolutely adores the place. Hope you’re enjoying your time stateside! I have only visited the city once, when I was a teenager. As an adult, I would love to go back and visit it again. 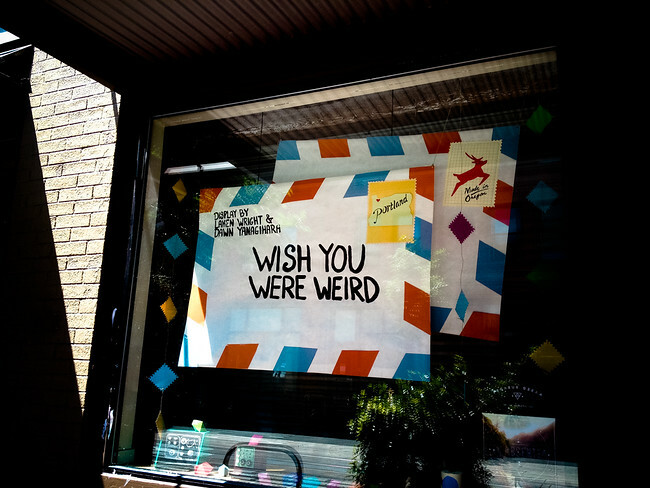 So is Portland trying to steal Austin’s tagline, or is this now a “Keep It Weird” trend in all hipster cities?? P.S. Have you spent much time in San Francisco? Because, coming from the South, the “whiteness” was nearly blinding to me when I first moved there. Interesting about the whiteness, I was thinking it might be a cool place to live until you mentioned that. I have not yet been to Portland but you make it seem a city that I’d like visiting. I wouldn’t be able to live there either if it wasn’t as diverse as Toronto. I also found it interesting how the light rail is in Spanish, despite not seeing too many, if any native Spanish speakers. Great city, but yes a shocking lack of ethnic diversity! I went to Portland a few years ago with a Cambodian-American friend from Southern California. She pointed out things that surprised her, like “OMG look at that gardener with the leaf blower… he’s white!”. Later on we noticed the kitchen staff at the Indian restaurant we went to were all white! I’ve only been to Portland once, for an afternoon. I remember it having a pretty vibrant centre. Really need to go back. Funny that you say everyone being white bothered you – that always annoyed me when we lived in Australia too. 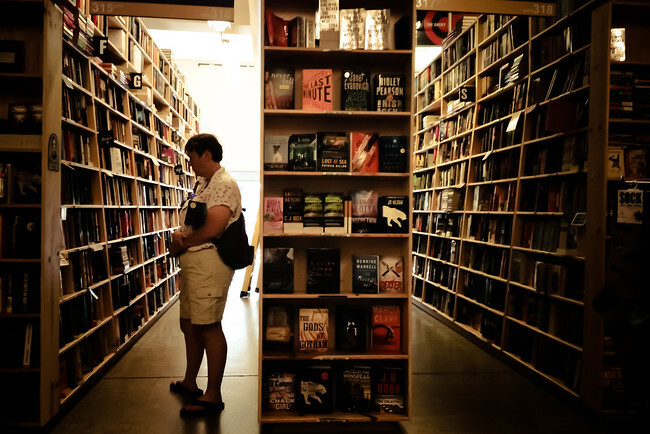 I’ve been to Portland several times and have always enjoyed it – especially the bookstores. 🙂 Since I grew up in Northern Canada in predominately white regions, Portland’s white population didn’t stand out to me so much as it would now. I haven’t been to Portland but have heard many people say that they also love it but that it lacks diversity. Diversity for me is hugely important, not just because I thrive on it, but also because it’s central to my work. But I do want to visit Portland. Seems very cool. Great article! I’m a Portland resident and, after living in so many other states around the country, it’s the town I’m always glad to “come home” to – for the incredible food & produce bounty, the beer, the people (hipsters aside), the wine country in our backyard, the ocean, rivers & mountains, the public transport, progressive attitude and more. I think it’s important to note that many neighborhoods here *are* more predominantly white than others, but I think that’s also true for so many other metropolitan cities as well. I live in St. Johns (North Portland), which is wonderfully, racially diverse. Give me a shout next time you’re here & I’ll be your tour guide of the places with a little more local color. (P.S. I can’t stand Voodoo Doughnuts either). Portland is one of the only American cities that I’ve always wanted to go to but has somehow alluded me. Jealous! We LOVE Portlandia!! We’ve watched season 1 about 4 times on the road. Definitely a city we will check out when we make our way to the U.S.! Have you seen the feminism bookstore skit?? It was great to hang with you in Portland! I am from Portland, but now live in Spain. Man, has it changed! Every time I go back for a visit I am wowed by how cool it is. I may very well not be cool enough to live there anymore….PDX is wonderful but you’re right, it’s not a big, big city, and it’s not super diverse. I would agree with a comment above that mentioned to go out of PDX to see other cultural communities (read: not all white people)…Yes, Beaverton, or even Hillsboro if you really want to hear some Spanish. Also, Portland is not Oregon. It’s a bubble. Head East and suddenly it’s a lot less Portlandia and a lot more cowboy. I have always wanted to visit Portland. People that I know who have been says it reminds them of Albuquerque. Hopefully one day I am able to visit. Very cool I’ve always wanted to visit Albuquerque.